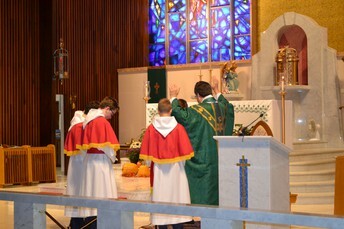 As we begin the third trimester, we look forward to the coming of Spring and the Easter Season. With this comes new hope and joy within our lives. Considering the recent events and issues occurring throughout the nation, it has given the Our Lady of Good Counsel School community cause to take a moment and reflect. Providing a safe, caring, and secure environment for our school family is an essential part of our mission, vision, and the future success of our children. I want to assure you that we meet on a regular basis to review policies and procedures as it relates to the security in our school. We are putting steps in place to evaluate and update procedures throughout our school. We are looking for the success of this year's Race for Education in May to assist in the financial cost that will be associated with these updates. Please look for more information in coming newsletters. Congratulations to our 2nd Grade students as they celebrate the Sacrament of Penance this evening! Please keep these students and their families in your prayers. If you are interested in participating in the Washing of the Feet on Holy Thursday, please email me or call the school office. I am looking for two more volunteer parents or older siblings of students. Terra Nova testing begins tomorrow for students in Grades 2-7. The remaining grades will have classes all day. Those grades that are testing will resume their normal schedule after testing. Please make sure if your child is testing that they get a good night's sleep and eat breakfast. This goes a long way in assisting your child in performing well. Minute to Win It has been rescheduled for Friday, April 13th from 6:00 to 9:00 PM. The Spring Fling Dance has been rescheduled for Friday, April 20th from 7:00 to 10:00 PM. Thank you for your constant support and prayers for our school. I encourage you to continue to support our work as we advance our mission to provide a transformative education steeped in academics and faith to our deserving students. 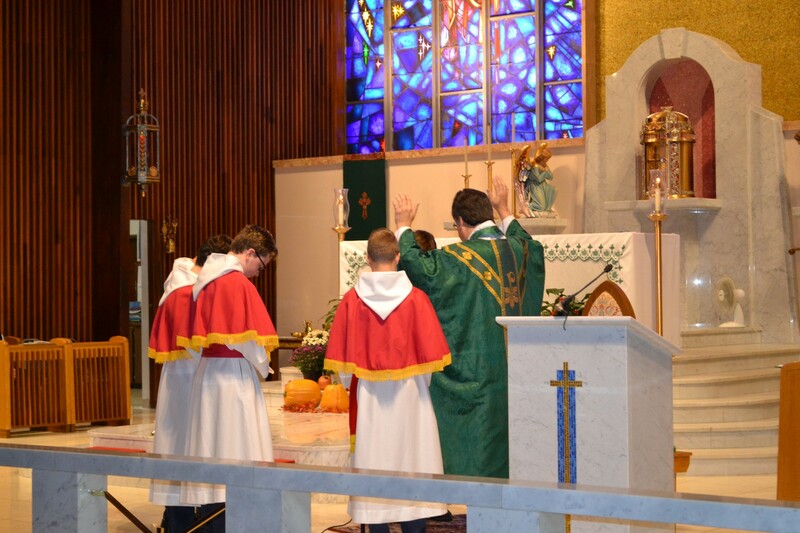 There is no greater investment for forming our future saints than a Catholic education! Please carefully review this week's newsletter for many reminders and updates. We thank you for entrusting your children to us and for the sacrifices you make each day to send your child(ren) to Our Lady of Good Counsel Catholic School. Our Lady of Good Counsel School is excited to announce that we are offering Tuition Transfer Grants for the 2018-2019 school year. 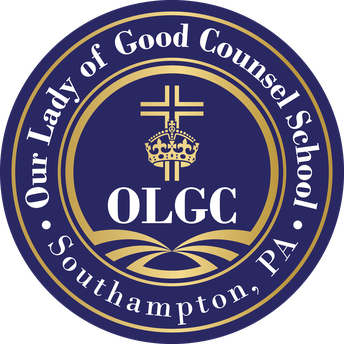 The Tuition Transfer Grant Program is available to those students in grades 2 through 7 who wish to transfer to Our Lady of Good Counsel Catholic School from a public or non-Catholic school. All eligible students will receive $1000 off of their first year's tuition & $500 off of their second year. Please share this information with anyone who would be interested in this program. Thank you! 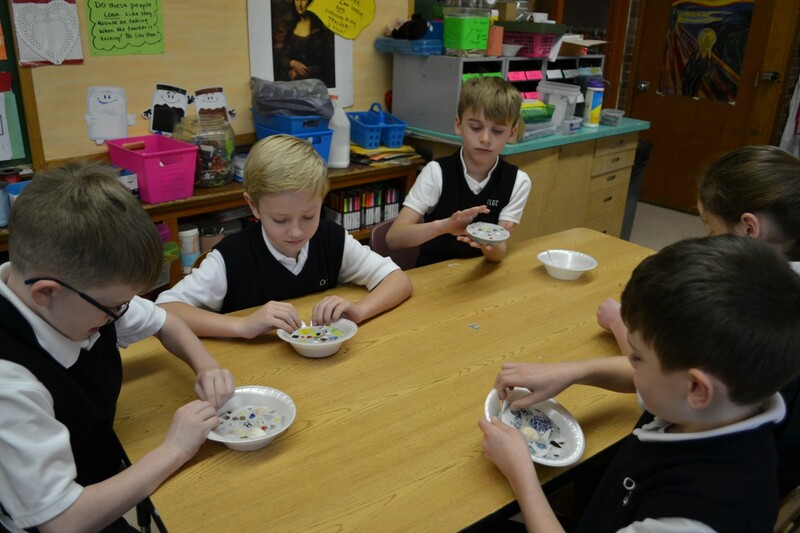 The Business Leadership Organized for Catholic Schools is an independent charitable organization that distributes designated and undesignated funds donated by businesses under the Pennsylvania Educational Improvement Tax Credit Program (EITC). Applicants must fall within prescribed income levels to be eligible to receive funds. Those who wish to apply can submit an application for review for qualifications and the results are then forwarded to BLOCS organization as well as schools. Funds are available for grades Kindergarten through 8. For more information about BLOCS, please see their website, www.blocs.org. For 2018-2019, applications must be submitted online through FACTS, Inc.
A completed Federal Income Tax Return will be required to be submitted as evidence to complete this application. See everyone this Saturday 3/17, 6:30 PM - 10:30 PM in the gym for live Irish music, Irish dance performances and DJ, raffle baskets, beef and beer! Feel free to bring your own drink of choice, appetizers and desserts. We raise $$ per pound of clothing collected, so clean out those closets...help us beat last year's total of $1,456.60! NOTE: We can no longer accept HARD TOYS or HARD ITEMS such as house gear, lamps, baby items, etc. Any student who collects 100 Box Tops will earn a FREE dress down day! Once your family reaches 100 Box Tops - please send them to school in a Ziploc bag, clearly labeled with your child's name, homeroom, and the number of Box Tops collected. Please be sure to separate out all expired Box Tops. March winners will be announced at the April Community Homeroom. Coming Soon... A NEW LOOK! It is time to vote for OLGC's new uniforms! Please read our new uniform flyer carefully & follow the link to vote for the pieces you want to see be included in our new look. Voting is now open & will end on Friday, March 30th. The winning pieces will be announced at our April Community Homeroom. Thank you! OLGC Logo Apparel is here! We are running an apparel sale with Kampus Klothes & have many different offerings & items for you to purchase! We are also offering both youth & adult sizes & every item features our new school logo! The sale has now begun & will run until Sunday, March 18th. 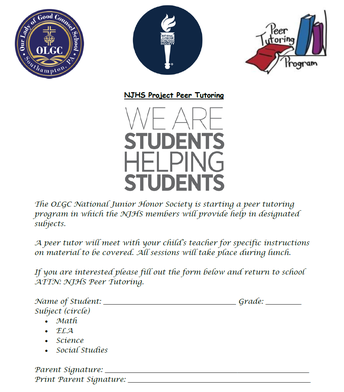 The OLGC National Junior Honor Society is starting a peer tutoring program in which the NJHS members will provide help in designated subjects. A peer tutor will meet with your child’s teacher for specific instructions on material to be covered. All sessions will take place during lunch. If you are interested please fill out the form & return to school ATTN: NJHS Tutoring. 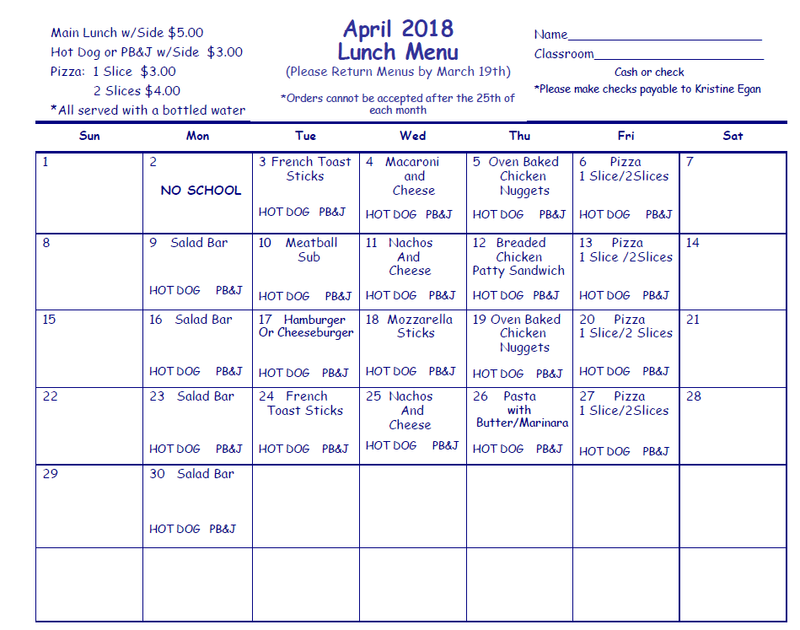 Here is the lunch menu for April 2018. 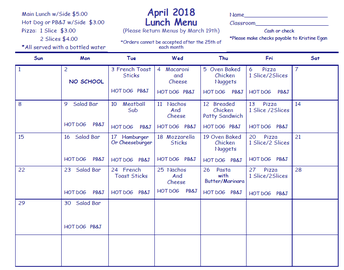 Please make your selections & return your menus along with payment back to school no later than Monday, March 19th. Thank you! Click HERE for a printable menu. Student Council will be hosting their annual "March Madness Tournament" on Friday, March 23rd. The tournament will be a 3 on 3, single elimination. The teams will be chosen randomly & will be a mixture of boys & girls. The cost is $5.00 per person. 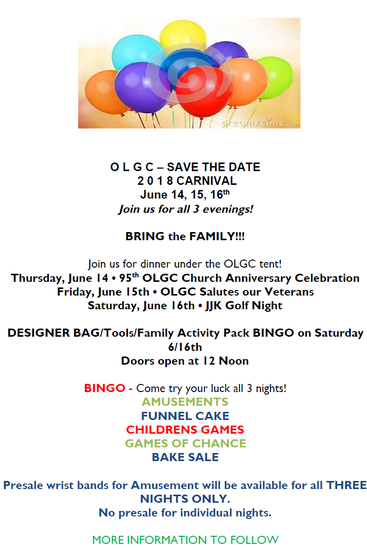 You may pay by cash or checks payable to OLGC. If you have any questions, please do not to hesitate to reach out to Mrs. Acker. 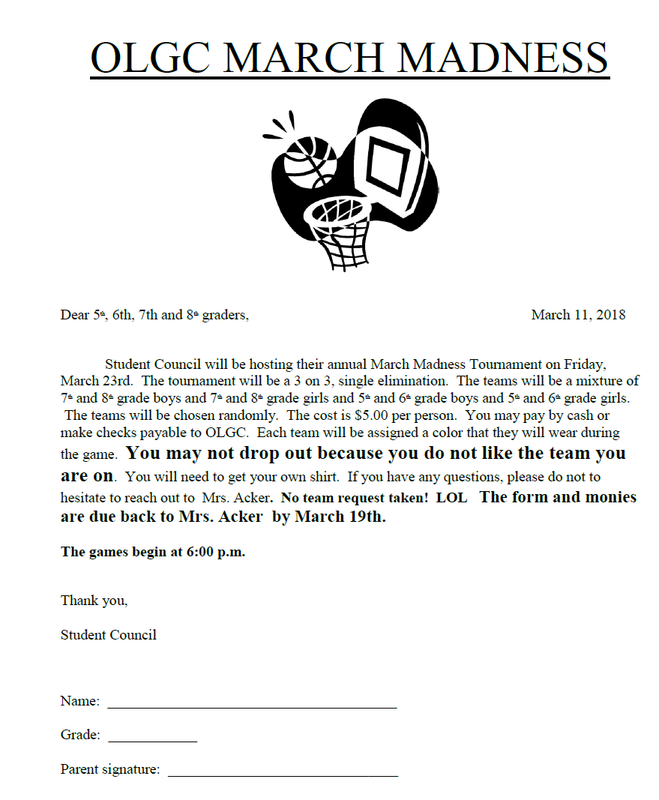 The form and money is due back to Mrs. Acker by Monday, March 19th. The virtue for the month of March is Cooperation. Cooperation is the ability to work together for the good of everyone. It is a willingness to respect others and to follow rules which keep everyone safe and happy. Cooperation is being helpful to one another and sharing the load. It is joining others in order to do something that cannot be done alone. If you see someone displaying the virtue of cooperation, fill out a virtue slip for them. The winners will be announced at our next Community Homeroom. Winter is here and with that comes the cold and flu! ​ ​If​ ​your​ ​child​ ​is​ ​sick,​ ​please​ ​keep them ​home.​ ​Please remind your child to always wash their hands. Hand washing and the flu shot are the best ways to avoid the cold and flu. Please make sure your child gets plenty of rest and has a healthy diet to keep their immune systems strong and help avoid these illnesses. The​ ​safety​ ​of​ ​our​ ​students​ ​is​ ​our​ ​top​ ​priority.​ ​No​ ​visitor​ ​or​ ​volunteer​ ​may​ ​go​ ​to​ ​any​ ​area of​ ​the​ ​school​ ​without​ ​first​ ​signing​ ​in​ ​at​ ​the​ ​office​ ​and​ ​receiving​ ​a​ ​visitor’s​ ​badge.​ ​​Visitors or​ ​volunteers​ ​are​ ​not​ ​permitted​ ​to​ ​go​ ​to​ ​a​ ​classroom​ ​to​ ​visit,​ ​confer​ ​with​ ​a​ ​teacher without​​ an​​ appointment,​​ or​​ visit​​ any​​ child​​ in​​ class, ​​at​​ lunch,​​ or ​​in​​ the​​ schoolyard.​​​​ If parents​ ​wish​ ​to​ ​arrange​ ​a​ ​conference​ ​with​ ​a​ ​teacher​ ​or​ ​the​ ​principal,​ ​they​ ​should​ ​call​ ​the school​ ​office first. 4/14 - 4/15: Clothing Drive sponsored by P.I.E. 4/21: Clothing Drive sponsored by P.I.E. Our Student Altar Servers are entrusted with showing our entire school community how to act out our faith at Mass & assist in liturgies. 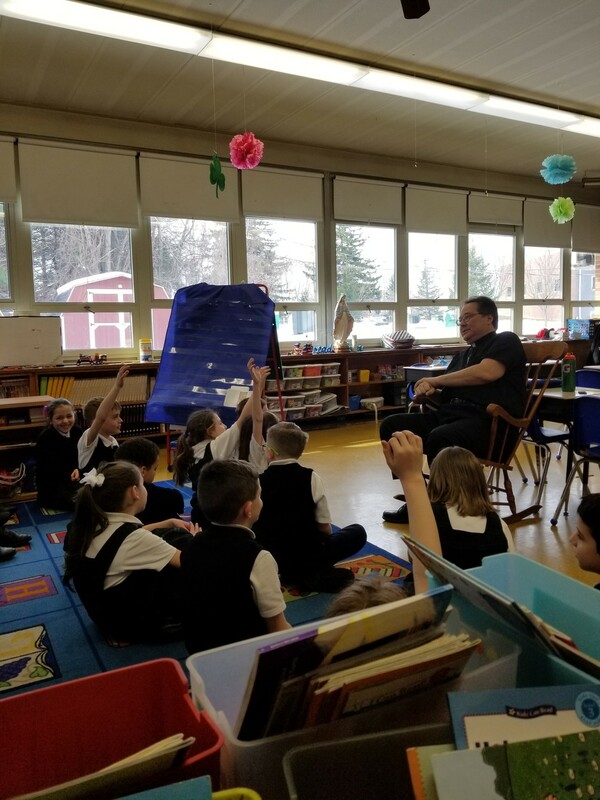 Father Suskey met with the 2nd graders this week to discuss the Sacrament of Penance, which they look forward to making today, Thursday, March 15th. 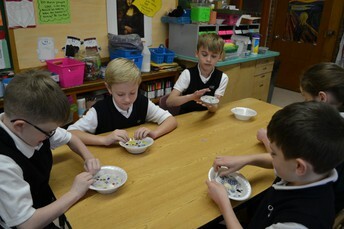 Our co-curricular Fine Arts class allows our students to show self-expression in class projects, assignments & lessons. 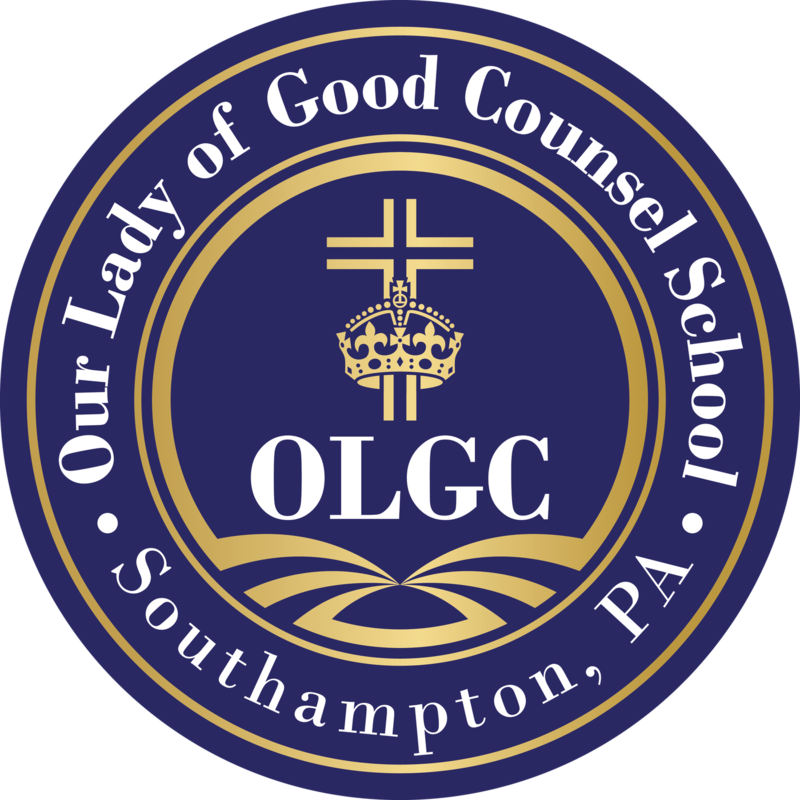 "Our Lady of Good Counsel Catholic School, under the guidance of Mary, seeks to empower students to commit to Christian service, dedicate their lives to Gospel values, and lead with academic excellence."